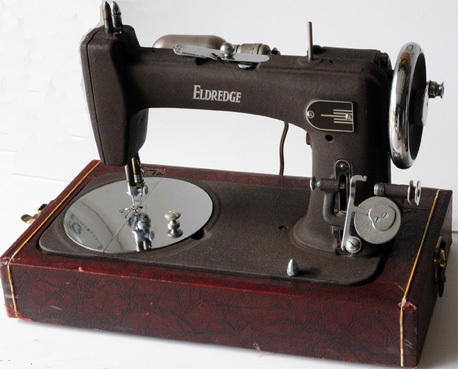 This is our really good looking Eldridge Sewing Machine. We don't know anything about its pedigree nor did we get a manual with it. This Eldridge was given to Jim during Father's Day 2008 by Elizabeth. The machine came from an antique mall in New Philadelphia, Ohio. 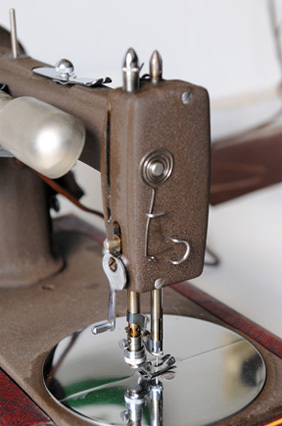 To wind a bobbin, a spring loop is connected from the motor to the bobbin winder. A very unusual feature of this machine is the large circular removable throat plate. While it may be coinvent to access the shuttle area, there is a protruding hold-down screw that gets in the way on occasion. 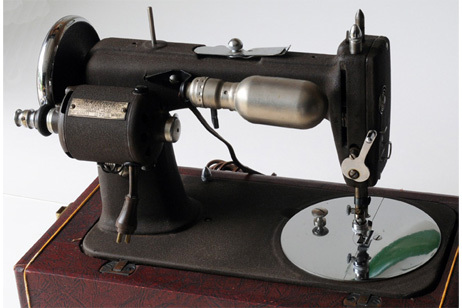 The machine has an elongated bullet-shaped oscillating shuttle or bobbin case. The motor drives the handwheel which it is always in contact with. 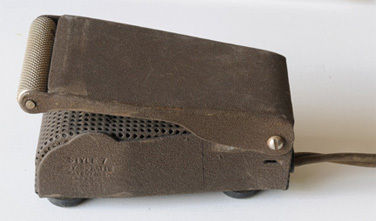 Two small rubber tires are used as the coupling. Only one tire is installed in the above image. The image shows our Eldridge faceplate. A lever on the backside raises the presser bar. The control rotates clockwise (as viewed) to raise the presser bar. It requires some getting use to if accustomed to levers on other machines which move up and down. The lever is raised in the image above. We haven't threaded up the machine at this time and we are waiting for a manual showing the thread path.